The Conservative Bible Project's authors argue that contemporary scholars have inserted liberal views and ahistorical passages into the Bible, turning Jesus into little more than a well-meaning social worker. Another thousand years from now portions of the “christian” bible will have strayed so far from the original that they will be completely unrecognizable. You can choose to reinterpret them into a new modern setting, but it still doesn’t change the words that were originally inscribed. Use Bible Verses by Comparison to read all translations side by side. Study Bible verses using NIV, KJV, ESV, and all versions found on one page. It is the main intention of our online Parallel Study Bible to allow users to study verses using more than one translation and version. This study tool can help people see how different translators have interpreted the original language. To search by word or phrase, enter your query in the search box and choose the two translations you wish to view comparisons for. To display a verse or a range of verses, enter the reference into the search box and choose the two translations in which you wish to view comparisons for.  Gospel Parallels: A Comparison of the Synoptic Gospels, New Revised Standard Version by Burton H. Throckmorton, Jr.
A classic since 1949, Gospel Parallels presents Matthew, Mark, and Luke printed side-by-side for easy and enlightening comparative study. Now fully revised and updated using the NRSV, it features a more readable type face and a new, even more effective system for comparison. The Gospel of Matthew contains some of the most famous passages that both Christians and non-Christians are familiar with. However, Matthew also presents itself paradoxically as preaching a Torah observant Christianity and a Christian mission that seeks to reach gentiles. The figure of Jesus in Matthew is that of a teacher, the founder of the Church, and the model for the apostles and Matthew’s own community. Matthew seems to be writing for a church community that needs encouragement to have faith in a time of trouble. Featuring vibrant full color throughout, the sixth edition of Bart D. Ehrman's highly successful introduction approaches the New Testament from a consistently historical and comparative perspective, emphasizing the rich diversity of the earliest Christian literature. Distinctive to this study is its unique focus on the historical, literary, and religious milieux of the Greco-Roman world, including early Judaism. As part of its historical orientation, the book also discusses other Christian writings that were roughly contemporary with the New Testament, such as the Gospel of Thomas, the Apocalypse of Peter, and the letters of Ignatius. An interesting looking textbook from Ehrman. This is a recommended text for Dale Martin’s course Introduction to the New Testament History and Literature. King David is a pivotal figure in the Bible, which tells his life story in detail and gives stirring accounts of his deeds, including the slaying of the Philistine giant Goliath and the founding of his capital in Jerusalem. But no certain archaeological finds from the period of his reign or of the kingdom he ruled over have ever been uncovered―until now. In this groundbreaking account, the excavators of Khirbet Qeiyafa in the Valley of Elah, where the Bible says David fought Goliath, reveal how seven years of exhaustive investigation have uncovered a city dating to the time of David― the late eleventh and early tenth century BCE―surrounded by massive fortifications with impressive gates and a clear urban plan, as well as an abundance of finds that tell us much about the inhabitants. Discussing the link between the Bible, archaeology, and history In the Footsteps of King David explains the significance of these discoveries and how they shed new light on David’s kingdom. The topic is at the center of a controversy that has raged for decades, but these findings successfully challenge scholars disputing the historicity of the Bible and the chronology of the events recounted in it. Purchased for $26.79 at Distant Land’s 30% discount/going out of business sale. Ask who did the most to shape the English language, and most people will answer Shakespeare. But another writer of much less fame did at least as much: William Tyndale, the first to translate into English the Greek New Testament and most of the Hebrew Old Testament (a follower, Miles Coverdale, finished the work, published in 1526). That work was later a major source of the 1611 King James version. Estimates of his contribution run as high as 90% of the King James New Testament. One of the earliest Tyndale Bibles will be auctioned by Chiswick Auctions today. The estimate of £8,000-10,000 ($10,200-12,700) seems a bargain for the work that immortalised “let my people go”, “the apple of his eye” and “go the extra mile”. Not that it did Tyndale much good: to render God’s word intelligible to ordinary folk was a daring act. 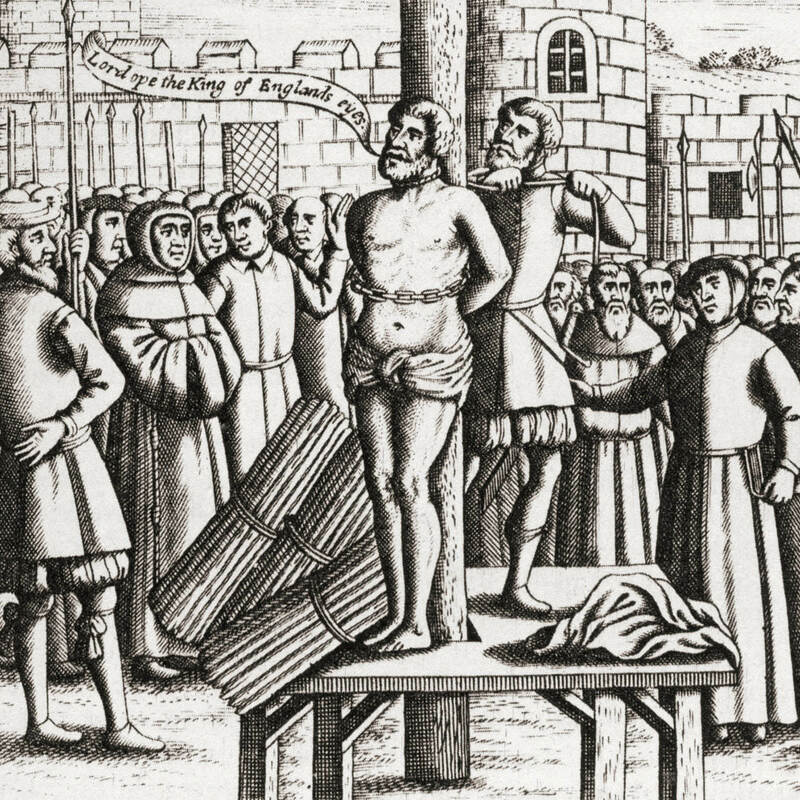 He was strangled and burned at the stake for it. Browse 1,000s of Jewish texts in the Sefaria Library by category and title.